This season’s front runner for the Most Valuable Player award needs no introduction. Harden, a.k.a The Beard has taken the league by storm! Averaging close to 31 points per game along with 9 assists and 6 rebounds, Houston’s star shooting guard along with the rest of the Rockets, are destroying teams in the NBA. While they (obviously) boast of the best overall win-loss ratio in the league, the most eye-widening aspect of Rocket’s season is that they are almost undefeated when their big 3 of Harden, Chris Paul and Clint Capella are healthy! Two losses they suffered were to the resurgent Pelicans, and to the Raptors (No.1 seed in the East), and that too in the last possessions of both games! Although the loss in Toronto ended Houston’s 17-game winning streak, it showed that the Rockets will be extremely hard to contain over a 7-game playoff series. 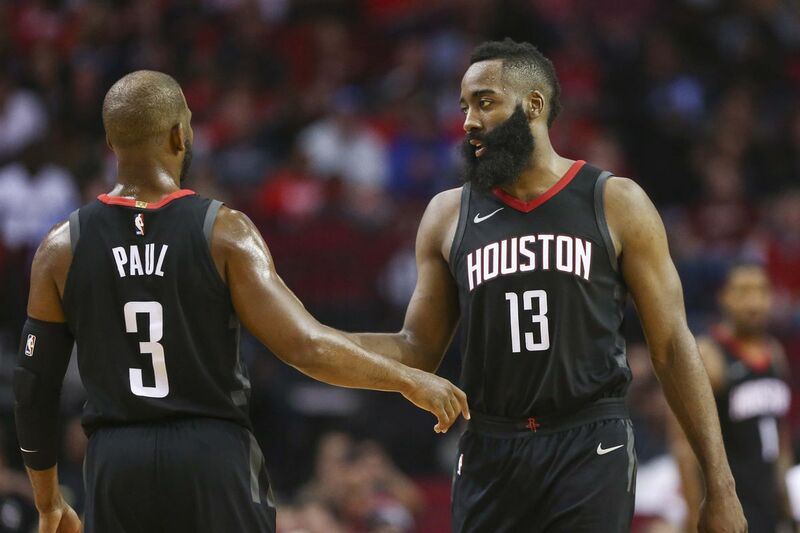 Houston has already beaten the defending champion – The Golden State Warriors, not once but twice this season, so why wouldn’t they bet their chances at this potential Western conference final match-up? While an MVP trophy will certainly be an improvement over Harden’s past few trophy less NBA seasons, he would be eyeing for the bigger price – a maiden NBA ring. After all, what is a No. 1 seed without a ring? "We haven't done anything. “We don't have time to relax. The No. 1 seed is cool and all, but we've got bigger things to worry about. We don't have time to relax or take deep breaths.”, said Harden. year in the league, King James is putting up numbers that is beyond astounding. 27.4 points, 9.1 assists, and 8.7 rebounds, for a 33 year old veteran in the league, is unheard of. But when doesn’t Lebron leave us mind-boggled? His extraordinary contribution to the game is just another ordinary day for the number 23. A former 4-time NBA Most Valuable Player winner, Lebron may be nearing the end of his career, but like wine, he is getting better with age. However, the same cannot be said of his wine and gold franchise – The Cleveland Cavaliers. The Cavs have had multiple team makeover sessions this season, yet they still don’t look close to being a championship calibre team. The exit of Kyrie Irving hurt them more than they would like to admit, Kevin Love is as injury prone as ever, Isaiah Thomas looked like a square peg thrust in a round hole and they were better off with fielding coach Ty Lue than D-Rose. Even though the Cavs look much better after the recent youth infused makeover, there is still work left to be done in the land. But if history has taught us anything, it’s that a Lebron-led team will always be the favourite to make it to the finals. ALWAYS! 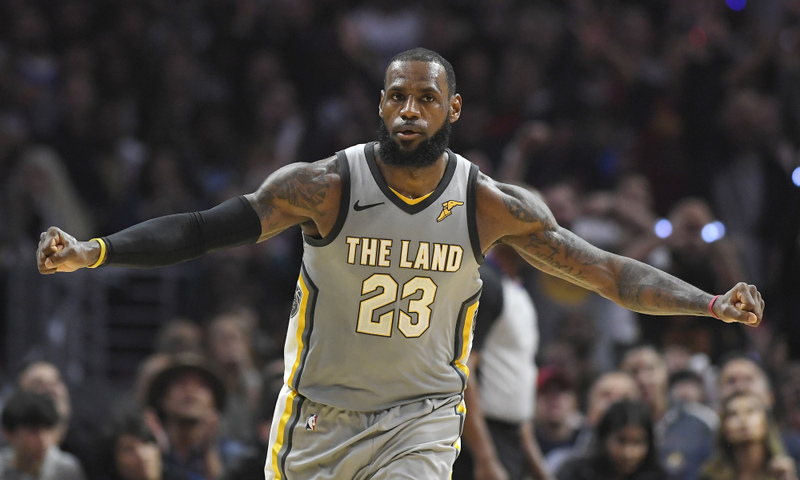 Lebron’s dominance over the East (7 finals in the last 7 years) has been such, that it is really quite hard to look beyond Cleveland this season as well. The MVP-esque numbers themselves that he is putting up whilst the squad is undergoing surgical changes, should tell you something about the man. 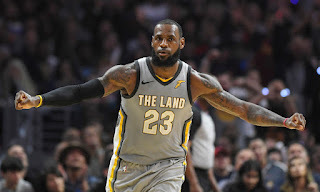 Although this year clearly poses a much sterner test to the ones he is used to, if Lebron continues to play at this MVP level, there is no saying what the Cavs are capable of. Anthony Davies (New Orleans Pelicans): My personal favourite for the MVP award. It is really quite unfortunate that we could not see how good THIS Pelicans team would have been in the playoffs. A season ending injury to DeMarcus Cousins took care of that. But it is thereafter, that Anthony Davies took notice. He’s scored 40 or more points five times this season, including a 53-point outing. There was also the game against the Jazz, which he finished with a whooping 10 blocks! An injury to his ankle did what no team could do this season – slow AD down. Davies is on the verge of making the jump from a good NBA player to a great NBA player. True, his playoffs record is dismal, but so were that of all the teams he was(is) in. There is enough evidence to tell us that this year too, wont fare better for the Pelicans. The likes of Houston, Golden State and Oklahoma, will easily beat them over a 7-match series. But a healthy Pelicans team with a raring-to-go Boogie and THIS monster-version of Anthony Davies, cannot be considered as a walkover. AD is averaging to 28 points, 11 rebounds and 2.5 blocks per game in his 6th year in the NBA and is easily, according to many, the best two-way player in the league. The fact that he just celebrated his 25th birthday a few days back, shows you the level AD can elevate himself to in the not too distant future. 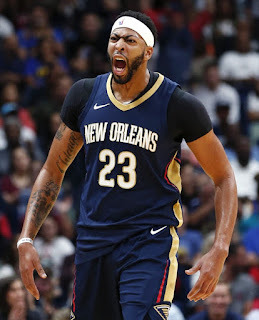 Fun Fact : AD is only the second player in basketball history to rack up 9000 points and 9000 swats prior to his 25th birthday. The first player? Although the 2014 Most Valuable Player and the Warriors are having a relatively quiet season by their standards, the whole league knows that come playoffs time, the Warriors will be as impregnable as ever. They, along with the Cavaliers have been finalists 3 times in the last 3 seasons. Barring the black cloud that is the Houston Rockets, don’t be too surprised if they make it to a sweet 4 out of 4. Widely considered to be one of the best teams in modern basketball, the Warriors are loaded with 4 All-Stars, who on their day can win matches with ease. Thus standing out in this team over the course of a season, is far from easy. 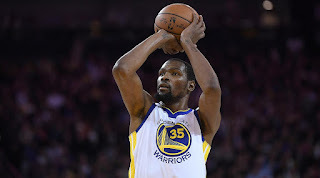 Given the calibre of the current roster, with the likes of 2-time winner, Steph Curry, 2017 Defensive player of the year, Draymond Green and fellow sharpshooter Klay Thomson, KD’s numbers would need to be even more spectacular, if he is to clinch the MVP award. 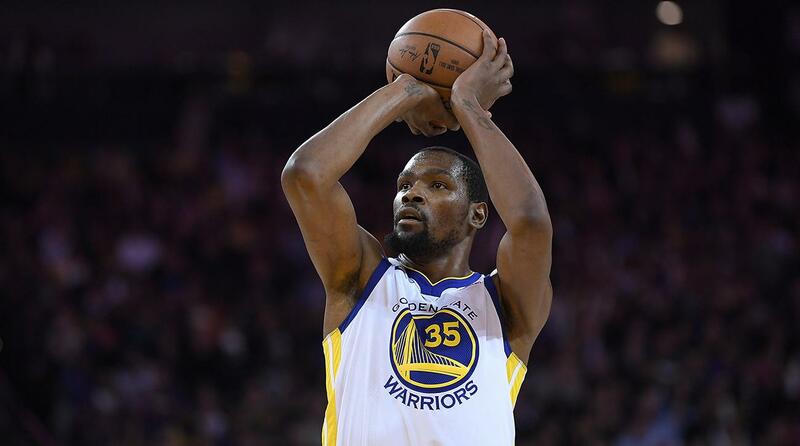 KD is averaging to 26.5 points, 6.9 rebounds, and 5.4 assists in a season, which is considered to be sub-par to his previous ones. Demar DeRozan (Toronto Raptors) : If you would have claimed at the start of the season that the Raptors would be perched on top of the Eastern Conference, being the first team to book a playoff spot, and that DeRozan would have been an MVP candidate, you probably would have been scoffed at. Fast forward to today and it’s your turn to scoff. 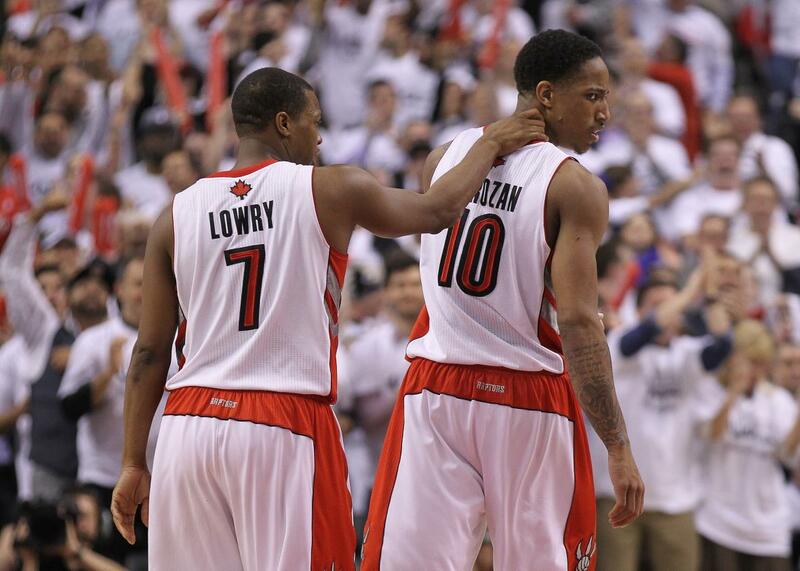 Demar DeRozan is lighting up Toronto in ways we can’t even imagine! Him and Kyle Lowry form a formidable duo, and unlike the great NBA duos we’ve seen in the past, these two genuinely love playing with each other. DeRozan is averaging close to 24 points, 5 assists, and 4 rebounds in the midst of leading his franchise to the No. 1 seed in the East. However, there is a LOT of credit to be given to head coach, Dwayne Casey’s intra-team dynamic change as well. They have modified their entire franchise outlook by embracing the 3-point shot and sharing the ball a lot more than before. It’s a massive shift from the way they’ve played before. But there is an even more elemental turn in the team’s dynamic in how their two stars, DeRozan and Lowry, function in the team’s system. In their first few years together, the duo could not complement each other’s game, and they were always thought of as a single dimensional team. However that has changed this season. With DeRozan putting up MVP numbers and Lowry proving to be more than an able point guard, it would be a welcome surprise if the Raptors can topple the Cavs or the Celtics in the post season. Damian Lillard (Portland Trailblazers) :It’s no surprise that the Portland Trailblazers sit right beneath Houston and Golden State in the Western Conference rankings. When Portland gets hot, they scorch! The West has become so fiercely competitive, that even a 9-game winning stretch in the months of Feb and March won’t be enough to cement your place in the playoffs. But even if they do miss out on a conference final spot, there is no taking away what Lillard has done for the Trailblazers this season. He TAKES OVER games in a way similar to Kobe Bryant’s Mamba performances at the death of a close-out game. 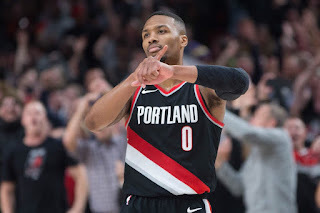 Averaging to 27.6 points along with 6.6 assists and 4.5 rebounds per game, Portland finally has an MVP calibre player to adore. With their second victory over the Warriors last month, and with victories over Oklahoma City Thunder, Minnesota Timberwolves and Utah Jazz on the previous streak, it’s no wonder that Portland is feeling confident when its Dame* time. Although Kyrie Irving (Boston Celtics), last year’s MVP Russell Westbrook (Oklahoma City Thunder) and Giannis Antetokounmpo (Milwaukee Bucks) are also strong candidates for the MVP race, it is hard to see the trophy fall into anyone else’s hands, other than our top 6.